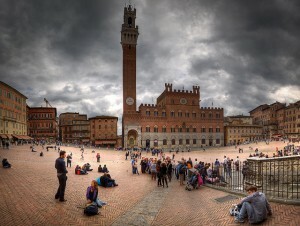 Siena is one of the most famous Italian cities and a place every tourist aims to visit during a trip to Tuscany. It is famous for its Palio that take place twice a year, and for its characteristic narrow streets flanked by brick buildings. The historic city is listed as a world heritage site by UNESCO and is filled with beautiful and interesting places to visit. But imagine you have just one day in Siena: what are the things you shouldn’t miss, on any account? Food in Siena: you can find many traditional dishes in Siena. Wild boar (particularly the Cinta Senese) and hare make for delicious croutons, pappardelle pasta and grilled meat. Then there are local sausages, cheese, liver, ribollita soup and more. Siena and its province also have great wines: Chianti, Brunello di Montalcino, Montepulciano and Vernaccia di San Gimignano. There is also plenty of choice for dessert: cantucci biscuits, Ricciarelli, Panforte and Cavallucci, accompanied by the classic Vin Santo.